This guy was meant to be part of my NOVA 2011 army, but I was rushed for time. After NOVA he sat on my desk, while a billion dark elves were put together. 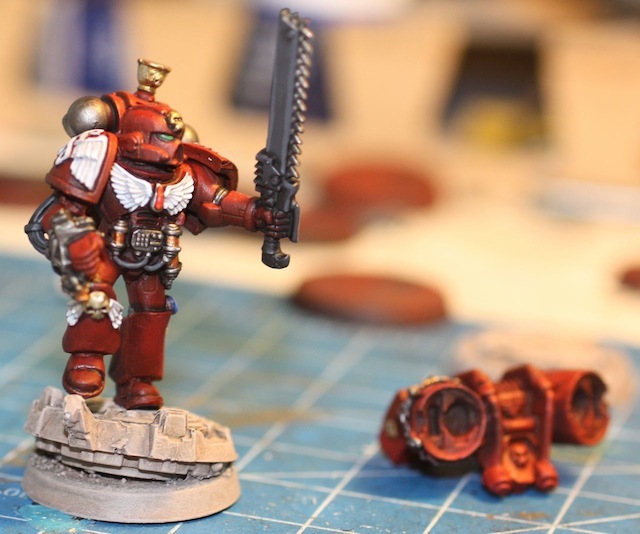 He was relegated to this position because he was not quite color synced with the rest of the army, so I just did not feel that same rush to finish him as I normally would. Fortunately, he was on hand and ready to become a test model for my new brushes. I need to buy new brushes more often. I tested three sizes of Raphael brushes on this model, and all of them were pure joy to use. The brushes hold their tips really well, in addition to holding more paint, which makes painting much easier and enjoyable. So if you haven't bought new good quality brushes recently, I recommend it. Now....what to paint... Maybe I should paint some of these guys. It would be easy to imagine that the above photo is meant to show you the utter clutter of my hobby space. 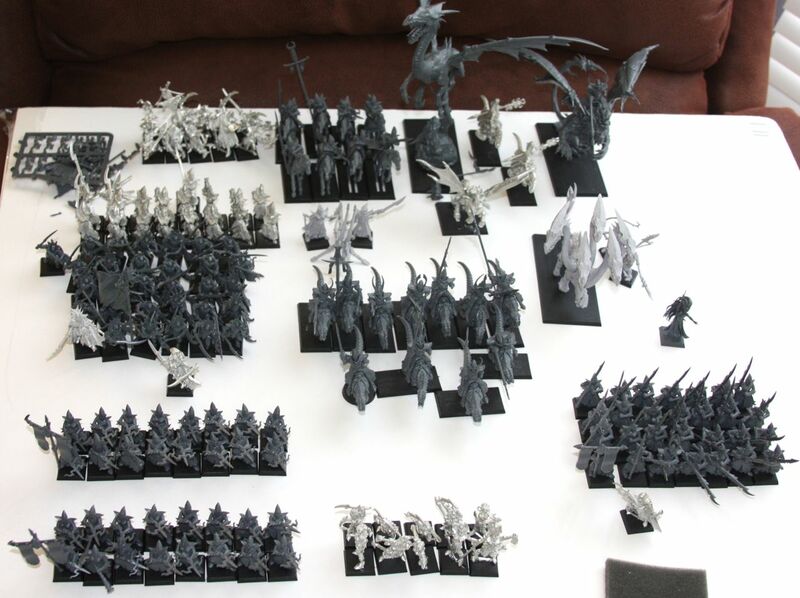 However, the real intent is to show you just how much of that space is covered with Warhammer Fantasy Dark Elves. I am not a fantasy player. Like many 40k players, I was drawn in by the originality of the grim dark future. I am not enthralled at all by the Fantasy background, but I do like the miniatures, and once that Black Dragon was released I was sold. I think this army will look fantastic when painted however I am intimidated by the sheer number of miniatures needed for a fantasy army. 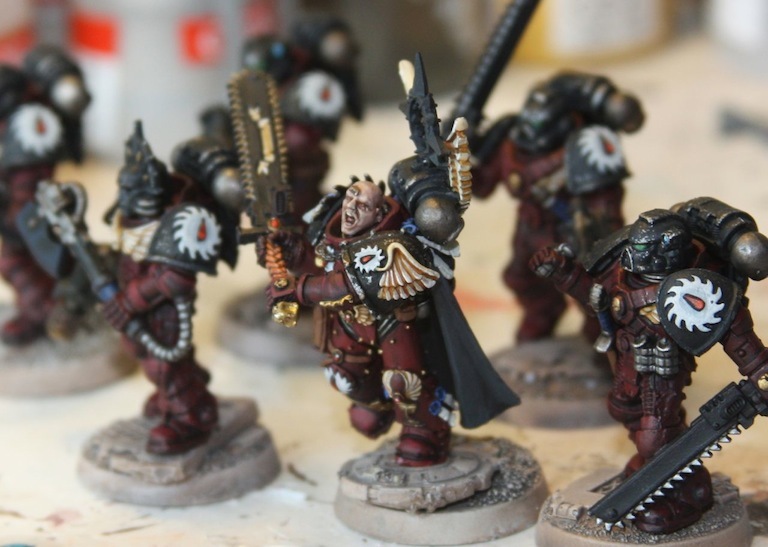 How is it possible to paint an army in a reasonable about of time (e.g. a couple of weekends)? There must be over 200 miniatures on that table. Just removing the mold lines is going to take a full day. The models should be smaller, so I can enjoy larger batters. Not Warmaster small, but like half the size they are now. The middle ground between Warmaster and fantasy is where the money shot is. Troops models should be modeled in 1 or two parts so large 100+ units could be put together easily. Round bases...oops sorry reflex. Bases should have magnets in them that hold them to the movement trays. No dwarves. It happened to the Squats, let it happen to fantasy dwarves. Less Magic. Let the troops fight the battle, not the heroes. *these rules are subject to change based on actual game play experience. Reading this list may cause anger, panic, derision, blurred vision, or dizziness for Fantasy players. If you experience a nerd rage lasting 4 hours, please consult a therapist. Now does Gabriel Seth fit in my army? I don't know. My only significant playing experience is the NOVA open. It was a trial by fire, which I loved, however I learned that infantry should never get outside their tanks. It is more likely that I paint up two Flesh Tearers Vindicators, since the kit is awesome, and making heavily damaged FT versions would be fun. I think I need to stop thinking with my NOVA training and go back to playing what looks good on the table. That is the only way I am going to every field that beautiful Storm Raven (yeah, I love the kit). At the NOVA I was taught that SR's were basically big grey flying targets that started and ended the game in the same place if I took first turn. I've been building a large Dark Elf fantasy army. I may even play it before it is even primed. Do I dare post shots of that army here? 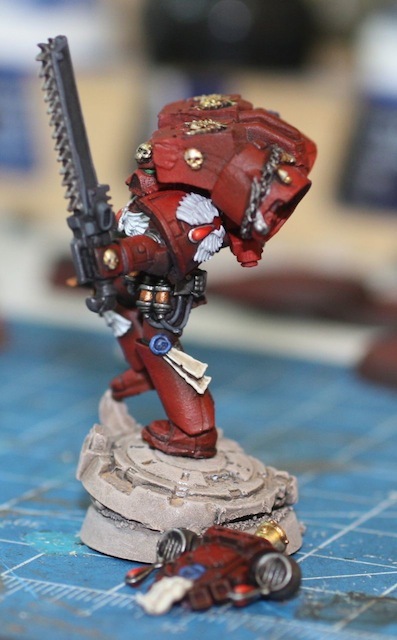 I mean this is a 40k hobby blog, not a square-baser joint. My wife and I have been busy painting our master bedroom, which gave me the excuse to not move my BA force and NOVA swag from the dining room table. I know having one chore completed does not cancel out the other, but hey, I wanted to see the force together. With paint fumes wafting, I snapped this shot of the army, now repaired from the load of damage entailed using my cardboard box+ double sided tape method of army transport. In the end what did me in was not pinning my troops to their resin bases. If I had done that, the chance of their bases sticking to the tape when I pulled the miniatures off would have been less. I think magnetizing bases is the way to go long term. It is far more convenient having a way to quickly place miniatures standing up rather than trying to squeeze them into foam cutouts. Even my tanks stayed where they needed to in the box, and I am a pretty aggressive driver. There was ample opportunity for acceleration to cause harm. 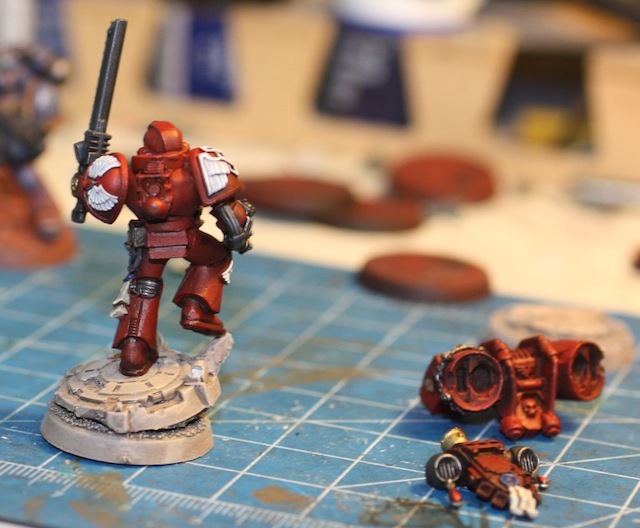 I just put together another flesh tearer squad using MK3 armor legs. 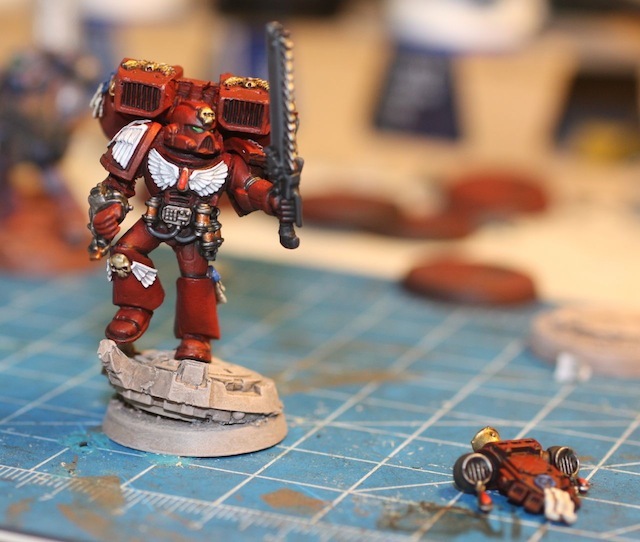 It might not have been the best idea, as the legs look a little small for the torsos, especially since I used assault marine torsos which are already a little bulkier than normal. The good think was that the legs gave me a lot of extra space to glue knives, grenades, and pouches. 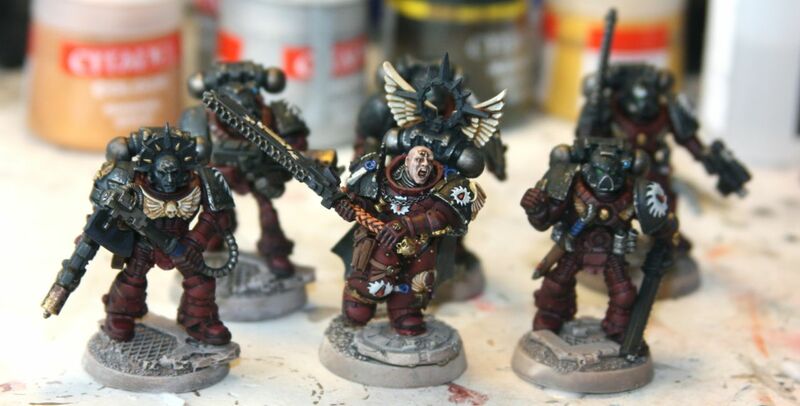 My FT are going to be quite battle damaged like my other squad, and have all kinds of weathering, so they need to look like they have been in theatre for some time.